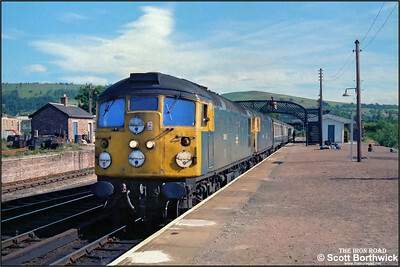 26015+26040 stand at Dingwall on 21/07/1983 whilst working 2K02 0655 Inverness-Wick. 26015 had been attached to the front of the train prior to departure from Inverness to meet the inbound morning service from Kyle of Lochalsh at Achnasheen as its loco, 26044, was running low on coolant. 26015 is detached from 2K02 0655 Inverness-Kyle of Lochalsh at Achnasheen on 21/07/1983 and runs forward onto 26044 (visible in the distance) which was running low on coolant whilst working 2N12 0710 Kyle of Lochalsh-Inverness. 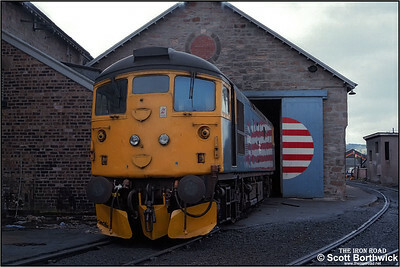 Inverness TMD had been made aware of 26044's plight and hastilly attached 26015 to the front of 2K02 prior to departure. 26040 continued to Kyle of Lochalsh with 2K02 whilst 26015 piloted 26044 to Inverness on 2N12. 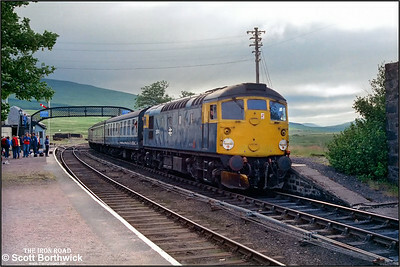 After 26015 had been removed, 26040 stands at Achnasheen awaiting departure with 2K02 0655 Inverness-Wick on 21/07/1983. 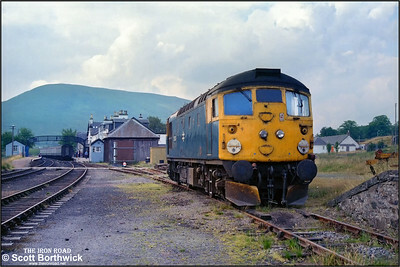 26015 pilots 26044 at Dingwall whilst working 2N12 0710 Kyle of Lochalsh-Inverness after the latter had run low on coolant at Achnasheen on 21/07/1983. 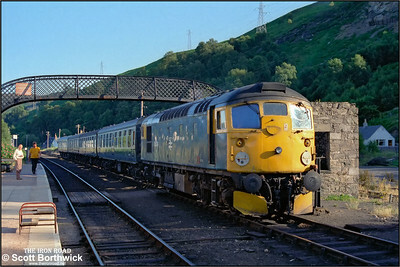 26032 stands at Dingwall prior to running round its short Inverness bound PW train on 21/07/1983. 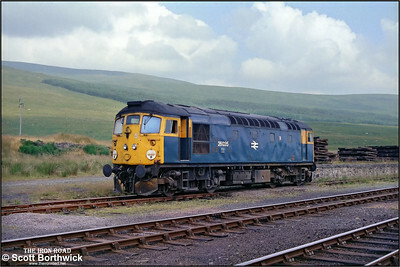 26024 stands on Inverness TMD (IS) at 1030 on 21/07/1983. 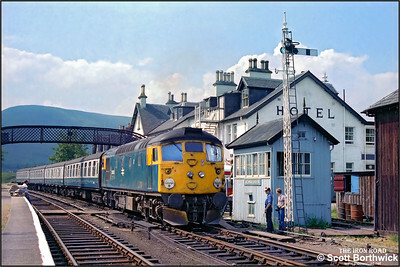 The loco would later work 2K14 1755 Inverness-Kyle of Lochalsh. 26024 awaits its departure time at Inverness with 2K14 1755 Inverness-Kyle of Lochalsh on 21/07/1983. 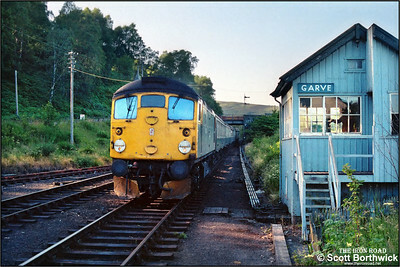 26024 pauses at Garve whilst working 2K14 1755 Inverness-Kyle of Lochalsh on 21/07/1983. 26034 approaches Garve on 21/07/1983 whilst working 2N35 1710 Kyle of Lochalsh-Inverness. 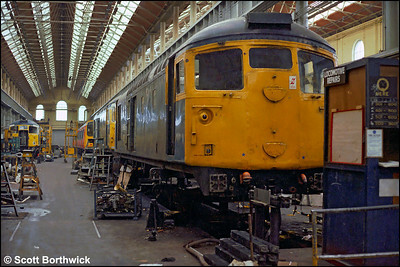 26023 undergoing work in the erecting shop at St Rollox on 24/07/1983. 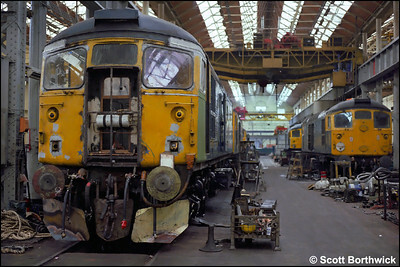 26029 is undergoing overhaul in the erecting shop at St Rollox on 24/07/1983. 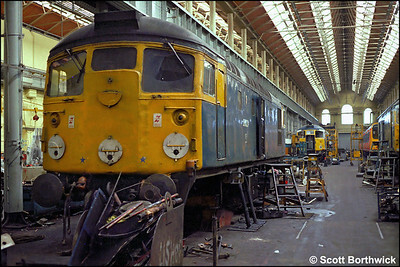 26028 undergoes overhaul in the erecting shop at St Rollox on 24/07/1983. 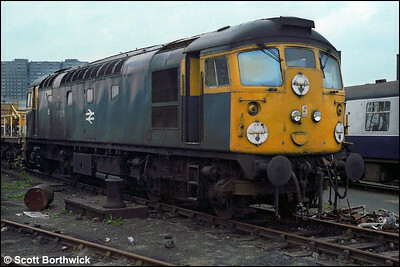 Dumped outside in the yard at St Rollox works, 26045 shows signs of fire damage on 24/07/1983. 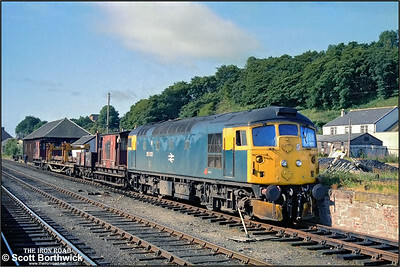 26035 working 2K08 1045 Inverness-Kyle of Lochalsh on 25/07/1983 had developed a hot axle box by the time it reached Achnasheen, where it was booked to cross 2N20 1110 Kyle of Lochalsh-Inverness hauled by 37025. 26035 was detached from its train and run into the adjacent platform allowing 37025 to be detached from 2N20 and run onto 2K08. 26035 then ran back onto 2N20 and hauled it into Achnasheen station. 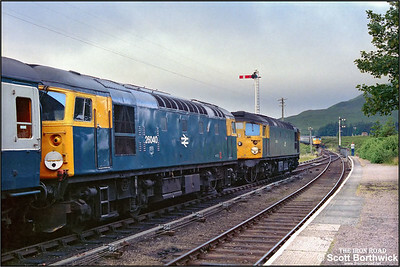 37025 then set off back to Kyle of Lochalsh whilst 26035 was removed from its new train and dumped in a siding. 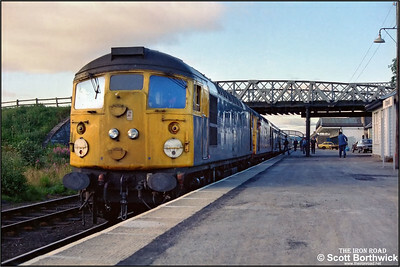 Assistance for 2N20 arrived some two hours later in the form of 37183 from Inverness TMD. Here, 26035 is seen being detached from the Inverness bound service shortly after 37025 had departed to Kyle. 26035 working 2K08 1045 Inverness-Kyle of Lochalsh on 25/07/1983 had developed a hot axle box by the time it reached Achnasheen, where it was booked to cross 2N20 1110 Kyle of Lochalsh-Inverness hauled by 37025. 26035 was detached from its train and run into the adjacent platform allowing 37025 to be detached from 2N20 and run onto 2K08. 26035 then ran back onto 2N20 and hauled it into Achnasheen station. 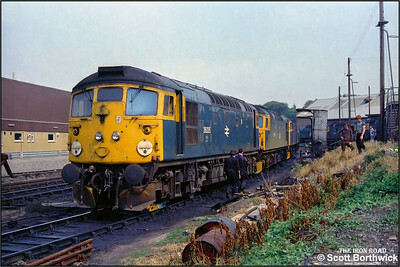 37025 then set off back to Kyle of Lochalsh whilst 26035 was removed from its new train and dumped in a siding. 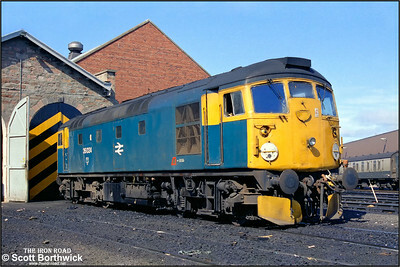 Assistance for 2N20 arrived some two hours later in the form of 37183 from Inverness TMD. 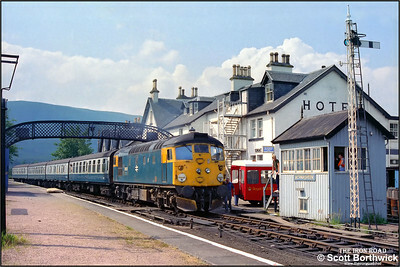 Here, 26035 is seen being detached from the Inverness bound service shortly after 37025 had departed to Kyle. Note the Royal Mail Post Bus awaiting the solitary mailbag from Inverness left on the westbound platform. 26035 stands dumped in a siding at Achnasheen after failing with a hot axle box whilst working 2K08 1045 Inverness-Kyle of Lochalsh on 25/07/1983. 26035 stands dumped in a siding at Achnasheen after failing with a hot axle box whilst working 2K08 1045 Inverness-Kyle of Lochalsh on 25/07/1983. The stock off 2N20 1110 Kyle of Lochalsh-Inverness stands in the platform awaiting a rescue engine from Inverness after its locomotive, 37025 had been commandeered to work 26035's train forward to Kyle. 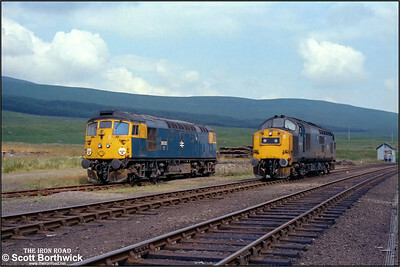 Rescue for 2N20 1110 Kyle of Lochalsh-Inverness arrives some two hours later in the shape of 37183 seen passing the stricken 26035 at Achnasheen on 25/07/1983. 26043+26030 stand at Inverness prior to departure with 1A27 1048 Inverness-Aberdeen on 26/07/1983. 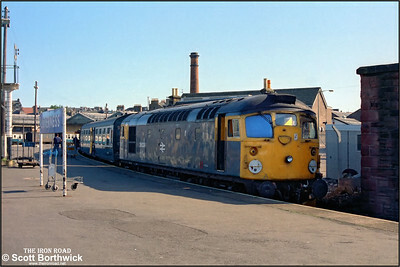 26035 stands on the fuelling road at Inverness TMD on 26/07/1983 after being hauled from Achnasheen on a wheelskate the day after suffering a hot box whilst working to Kyle of Lochalsh. 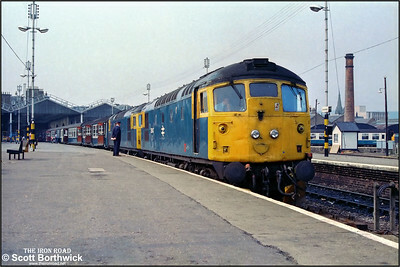 26032 is stabled on Inverness TMD (IS) at 1228 on 21/04/1984. 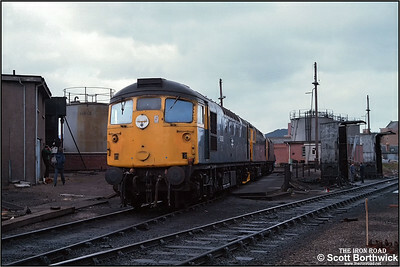 26036, 26041 & 26024 are stabled behind the fuel road on Inverness TMD (IS) at 1230 on 21/04/1984. 26037 certainly has a working steam heat boiler as it awaits departure from Carlisle on 28/04/1984 with 1S50 0840 Carlisle-Glasgow Central. 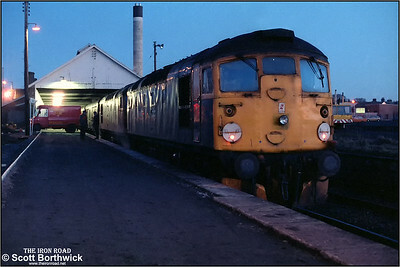 26040+26034 stand at Wick as the days mail is loaded onto 2N37 1800 Wick-Inverness on 18/12/1984.